See How Observation App works for a overview recap. We will not be covering authoring observations in this tutorial. You should have some sample checklists when you signed up. For more on authoring see Authoring Checklists. Have a look at your observation step, particularly next to the word "Observer". In our example the observer is "Store Manager". This means anyone who is part of the "Store Manager" group can oversee a learner performing this on-the-job training and sign them off. Step 7: Let's edit the observation step to change "Store Manager" to the group called "Observer". 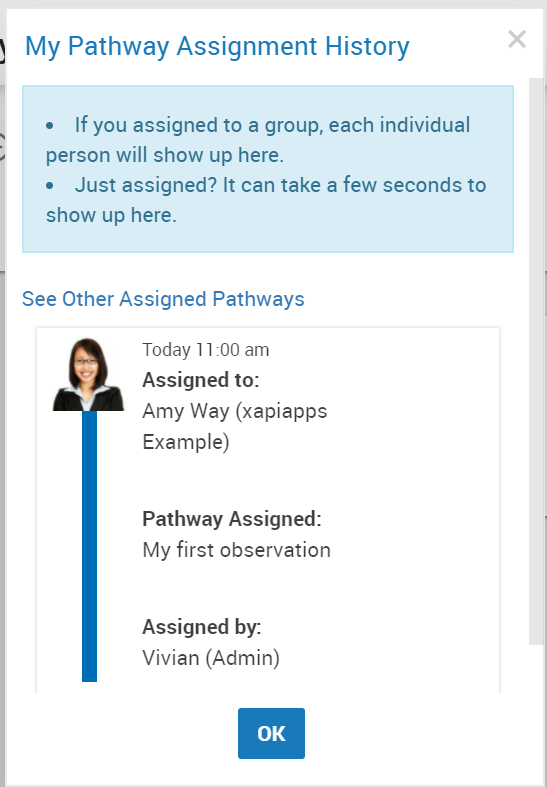 Search and select the group "Observer"
Step 15: Search and select Amy Way (the user you assigned the pathway to). Step 16: In the confirmation dialog click Yes. 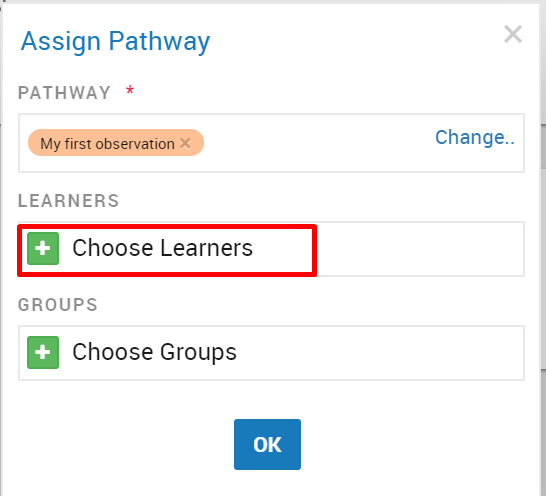 Click on the INFO button and you will that a dialog will pop up telling the user they cannot start this task without someone from the Observer group to oversee them. Step 17: Un-impersonate Amy Way by clicking on UNIMPERSONATE in the top green bar. Step 18: Click on People in the side menu. You'll see that Jim Bass is apart of the Observer group. Wait until the system morphs into Jim Bass'. Step 21: Click My Supervisor Tasks. There is a green chip with a number to indicate that Jim has an observation to perform. Notice Jim Bass has a Start button because he is the assessor. Amy Way is the assessee, therefore cannot start the task. Step 22: Complete the checklist as if you were assessing Amy Way performing the on-the-job training. Step 23: Click Sign off now to complete the observation. You will return back to My Tasks with the task marked as complete. Click UNIMPERSONATE to un-impersonate Jim Bass. You have completed the tutorial for getting started with observations!